On crucial day two of racing, challenges posed by lightening winds and the Bucket’s famous 'Not So Wiggly' course were a blessing to some, a curse to others. Gazelles and Elegantes sailed the long version of the course, which at just over 25 nautical miles, had been shortened by two nm to accommodate a finish well clear of a 'no sail' zone needed for the start of the afternoon’s Bucket Air Show, while likewise, the Mademoiselles and Grande Dames sailed a shortened version (20 nm) of the short course, which started near the entrance to the Port of Gustavia and meandered around several islands lying to the northwest of St Barths. The 54.6m Vitters Shipyard ketch Marie, yesterday’s leader in Elegantes, battled long and hard with the 44.6m schooner Adela again today. “Yesterday we sailed through them just on the last beat and won by a few boat lengths; today we weren’t quite so lucky,” said Marie’s Captain Wes Cooper. “We had a bigger battle with Elfje right behind us, to actually hold her off, and Adela got away from us.” The three teams are now in a three-way tie for first with four points each. Seemingly with ease, Jes Staley steered his 27.7-metre yawl Bequia, the only wooden boat here, to victory today, maintaining the lead he established yesterday in Mademoiselles. This is Bequia’s fourth Bucket: she won her class last year by a hair, and Staley said it’s the only regatta the yacht participates in. As such, he knows what to expect. In Grand Dames, the 55.9m Perini Navi ketch Rosehearty also kept her overall lead from yesterday, but the 37.6m ketch Axia won the day with a handsome lead over Rosehearty, which slipped by the 56m Perini Navi ketch Zenji well into the race to take second place. The 33m sloop Win Win, after winning yesterday in Gazelles, crossed the finish line in first again today, but was disqualified after a protest by the 33.4m Vitters Shipyard sloop Inoui. 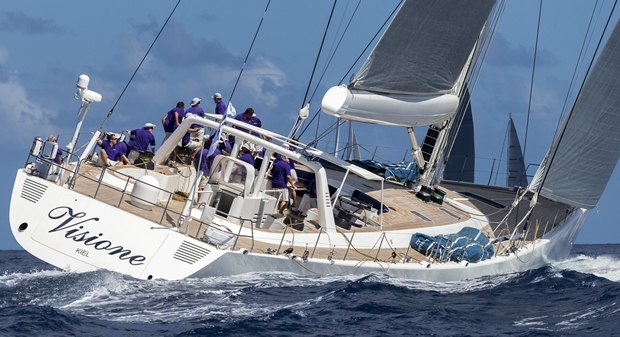 The jury concluded that Win Win did not give Inoui sufficient room as they were approaching Roche le Beouf, an island serving as a leeward mark. As a result, the 44.9m sloop Visione became today’s winner and moves to the top of the scoreboard with the 38m Perini Navi P2 following in second and Inoui in third.